Tuesday, January 25, 2011: Up to clear skies, wind and 45 degree temperatures…..brrrrrr. We need to head further south!!! On the road at 1015 by way of TX-35S and then TX-80. A ways out of San Marcos, Texas we came across this rather interesting sign for skydiving lessons. 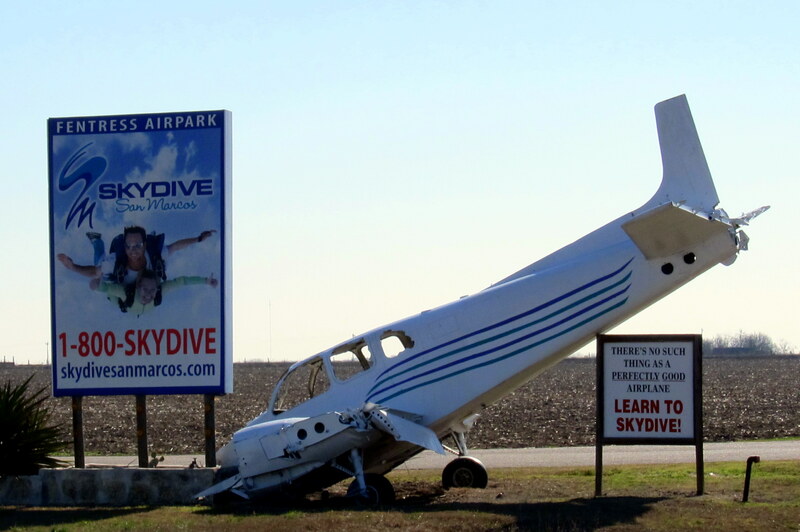 The little sign says; “There’s no such thing as a perfectly good airplane–LEARN TO SKYDIVE”. Talk about your effective advertising! We began to pick up the distinctive odor of crude oil that we noticed last year. There are oil wells scattered all about and storage tanks strategically placed as well. The smell was faint but quite noticeable. To the folks from these parts I bet it smells like money. I also noticed a number of signs for hysterical markers. I was reluctant to stop as I fell for that one out in California last year. But curiosity got the best of me and I finally pulled over to read what was on the sign. Once again…..just some dumb history stuff, and…..still – not – funny…..Hello! As we neared the town of Cuero, Texas we moved onto TX87S. Soon we passed the Cuero High School building and the home of the Fighting Gobblers. Bet that school takes some ribbing from the other high schools in the area. We came to TX-35 once again and headed south making our way toward Corpus Christi, Texas. Pulling into the RV Park on the Naval Air Station we discovered they were packed with “Winter Texans”. However enjoying another bit of road magic we scored a full hook up site anyway, which looked to be the last one available. The RV Park features large, level paved sites and occupies a large area near the end of the base. There is a beach and adjacent fishing pier that juts out into the Gulf. Yep, that is full sunshine you see and the trailer door and windows are wide open. The temperature is in the mid 70’s. True warmth at last! You might also notice that the spare tire is missing from the rear of the trailer. Well…..after 31,000 miles over predominantly rough back roads one of the tire bracket supports failed. Fortunately I noticed the break before our spare tire became someone else’s hood ornament. Also, Marvelous Monkey (remember him?) remarked that he is having a great time with Mr. Bill on this trip and was thankful to be in warm and sunny south Texas. He also really liked the kayak prominently mounted on our truck. I think he believes it’s a giant banana. Wednesday, January 26th through Sunday, January 30th, 2011–Corpus Christi, Texas: Well we only expected to be here for a day or two, but after discovering lots to explore, we decided we just had to stay longer. The warm temperatures, tropical feel and gentle sea breezes just reinforced the decision. Our site was reserved by some other “Winter Texan”. Likely one who plans ahead, unlike us. So we moved to the overflow field which meant dry camping for the remainder of the stay. The RV Park manager did put us on a waiting list for the next available full hook up spot however. As we have discovered on past trips the overflow sites are generally larger, which provides more privacy, they are more peaceful and generally feature scenic views. So since we can dry camp for up to ten days before filling our holding tanks, we just elected to stay here and removed our name from the waiting list. As an added bonus the overflow sites were half the cost of the regular sites and they were closer to the water! The sunrise over the Gulf of Mexico each morning was a real treat. The park has a few wild critters about. Prairie Dogs that we never did see…..but their presence was evident by the many dirt piles spread about. 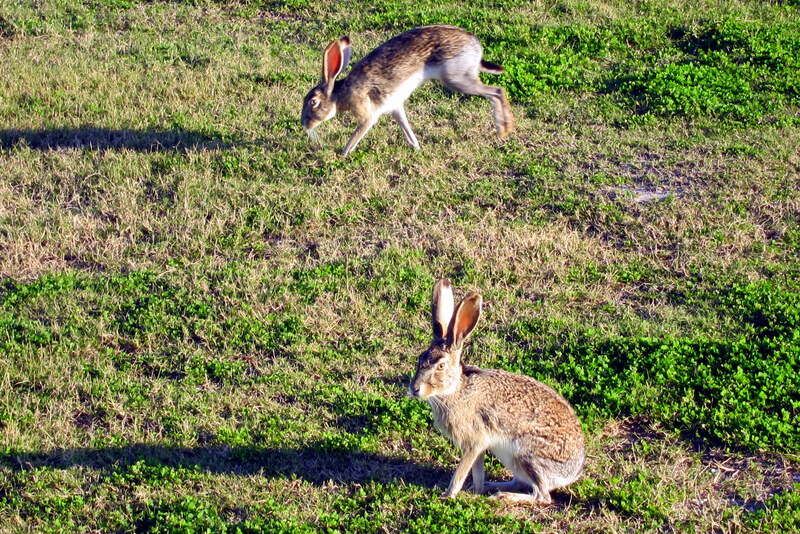 And Jack Rabbits that we did see, a lot, and all over the place. The out of proportion ears on those bunnies play a vital role in their survival. They allow the animal to hear much better, which is important when there isn’t much cover around to hide from predators. And they act like radiators which help to cool the animal in the hot summer sun. However I bet when those guys go on vacation to, let’s say Southern California, they get a lot of flak from the local bunnies. They are likely called Dumbo, and other derogatory names. Just like some poor kid had to endure in a certain San Diego school back in the late 1950’s. We spent the first day getting settled in, doing some shopping and oz’ing around the base. 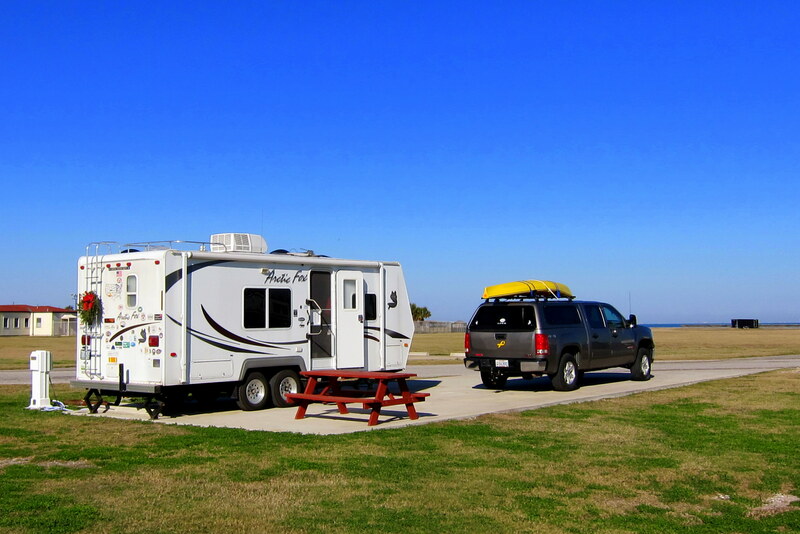 The RV Park is right on the Gulf of Mexico and within striking distance of Port Aransas to the north and Padre Island National Seashore to the south. We wound up enjoying five full and very enjoyable days in this area. And a significant trip milestone the temperatures were in the 70’s and 80’s so out came the sunscreen, sandals, shorts and t-shirts…..yea! Naval Air Station (NAS) Corpus Christi sits south of the city of Corpus Christi and supports flight training for young Navy and Marine Corps aviators similar to the mission at NAS Pensacola. 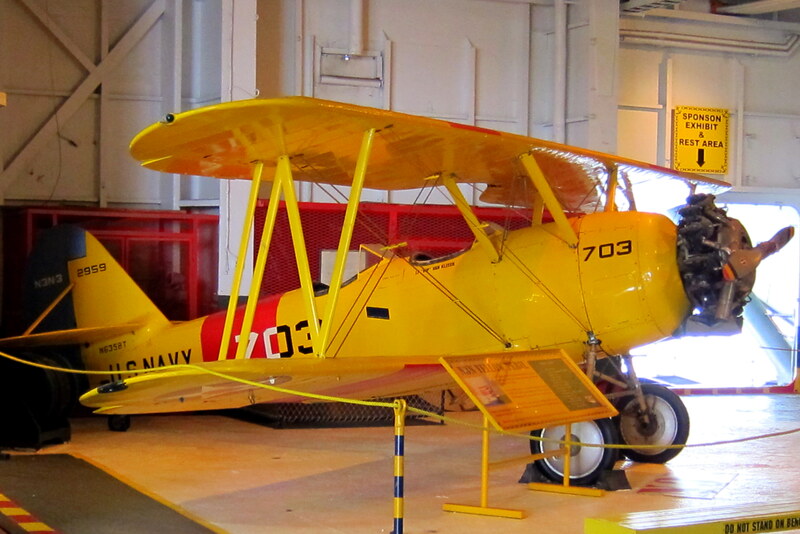 During World War II, 35,000 pilots earned their wings here. Every day except Sunday we noticed pilots learning the ropes in T-34 turboprop aircraft and the twin engine T-44. President George Bush (the 1st) trained here in 1943 and holds the distinction as the youngest person to graduate and earn the gold wings of a US Navy aviator. The base is also home to the Corpus Christi Army Depot, the largest helicopter repair facility in the world. In addition the US Coast Guard and Homeland Security Agency has a large presence here as well. This large multi-tenant base represents every branch of the US Military except the Air Force. Wait…..I did see a sign for the USAF Golf Course and Pilates Studio so I guess I stand corrected. One afternoon I took out my bike and explored the base. Soon I came to the old seaplane ramp and what remained of the hangers. At this site in the 1940’s PBY seaplanes were based. I found this particularly interesting as family history has me riding a seaplane as we returned stateside from my birthplace, The Territory of Hawaii, in 1949. There were many trails on base that are suitable for walking and biking. This one parallels the Gulf of Mexico shoreline and provides access to the fertile Golf waters for sport fishing, boating and beach combing. I stopped to visit with on old fellow who was using a unique fishing rig. He was “Sail Fishing” and his rig consisted of a foam float with a maneuverable sail. This was attached to 5,000 feet of 120# test line and secured to a motorized winch in the bed of his truck. The main line had many leaders attached with baited hooks. He would determine the wind direction, set the sail, and let the rig navigate out onto the bay. After waiting an hour or so he would winch the whole thing in and recover his catch…..up to twenty fish at times. Back at camp, we met an interesting couple from Idaho. Jim is a former Navy A-4 pilot and a recent retiree from the US Interior Department where he worked as a pilot in Wildfire Management. They were really into biking, kayaking and hiking so we shared a few stories and invited them to Maine to park their camper in our dooryard and explore our little corner of the universe. Likewise they invited us to Idaho to do the same. You meet some of the most interesting and nicest folks on the road. The easy access to the Gulf prompted me to take the kayak out for a few hours. It was warm but very windy as I paddled around the point and explored a few low lying islands that appeared to be bird nesting sites. There were many unusual looking seabirds poking around in the mud flats or diving for fish from above. I didn’t take any pictures as the heavy sea spray prevented me from removing my camera from its protective (zip lock bag) case. 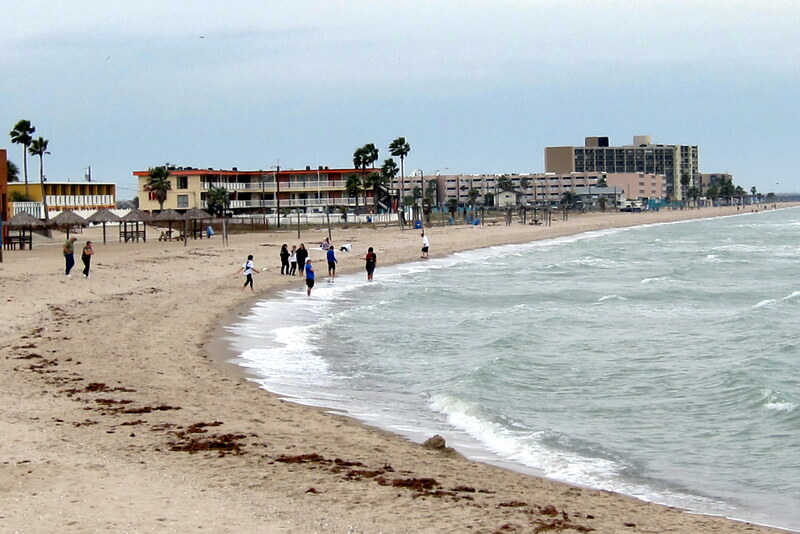 On a warm but overcast day we decided to explore the city of Corpus Christi and enjoy a few tourist sites. 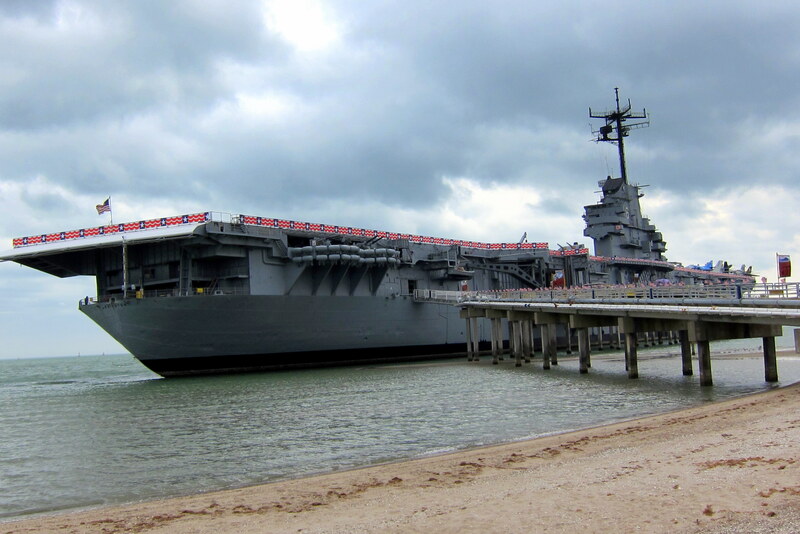 The city is host to a floating museum, the former USS Lexington a retired US Navy aircraft carrier. Never missing an opportunity to poke around old military hardware I left Kit at the foot of the gangway, as I did many times in my 22 year Navy career, and walked aboard. Kit was delighted to oz around the many gift shops, art galleries and cafes in the area. The carrier sits close aboard Corpus Christi Bay and even in winter it is the local hangout spot. Kit reported she noticed an old guy hanging out at the beach…..he was wearing a trench coat. 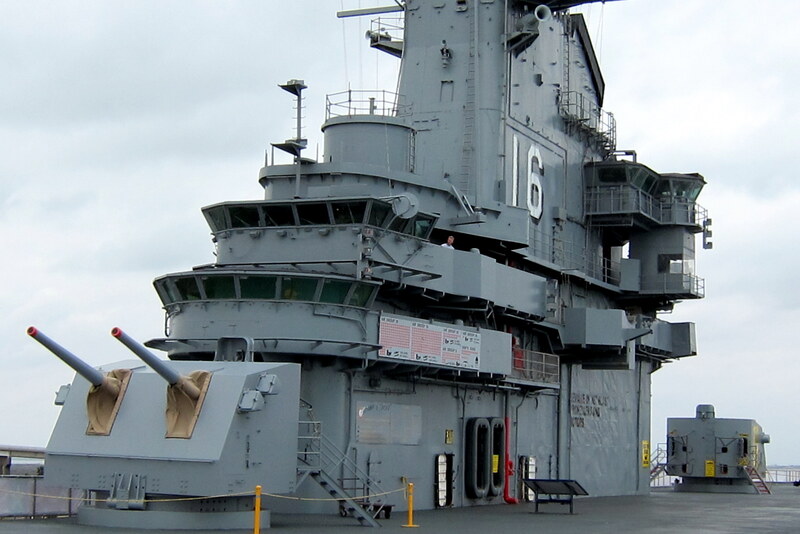 The Lexington CV-16, is the oldest remaining aircraft carrier in the world. Built at the Quincy Massachusetts shipyard in 1943 she served continuously until her decommissioning in 1991. The Lexington started life as an Attack Carrier (CV), later converted to an Anti-submarine Carrier (CVS) and finally served her remaining years as a Training Carrier (CVT). She is 872 feet long and carried a crew of 2,600 personnel. As a museum most of her spaces are open to the public and contain many displays depicting shipboard life as well as other military history of her time. 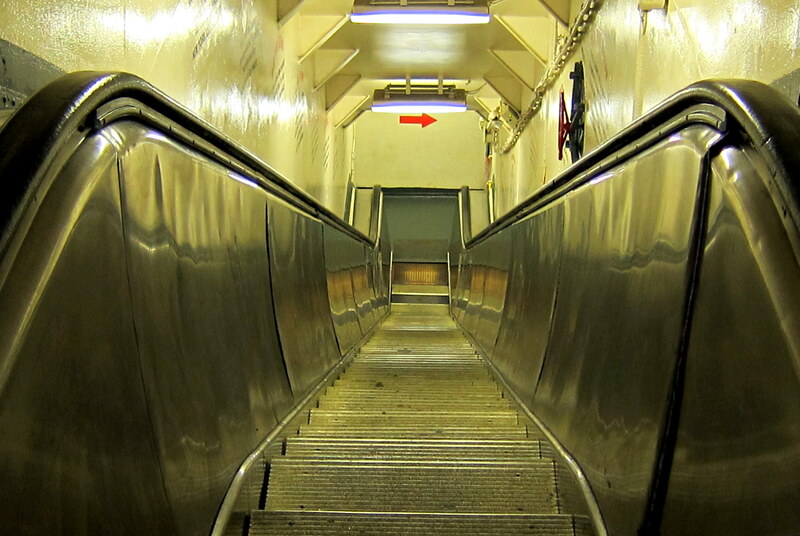 This huge ship has an escalator…..the only one I have ever heard about onboard a US Navy ship. Boy the aviation Navy is sure different…..we had to use ladders to get from deck to deck. 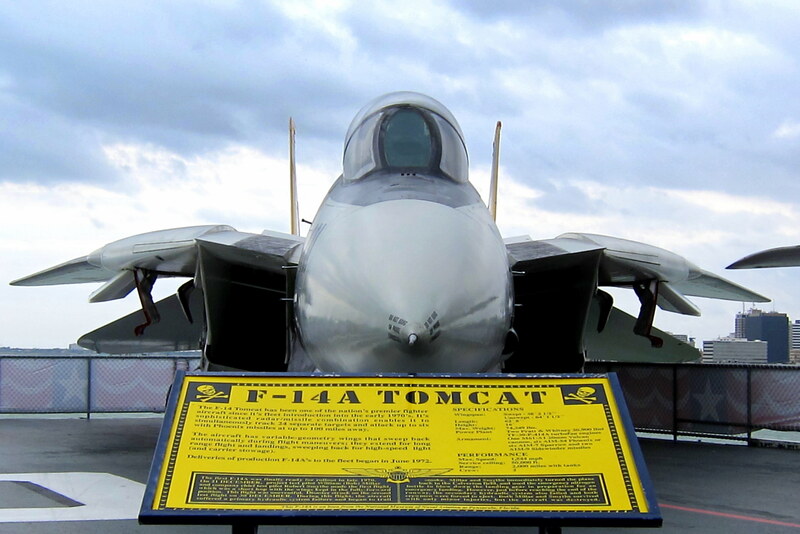 There are a number of vintage and modern aircraft on display as well as the varied self-defense weapons that she carried during her war years. 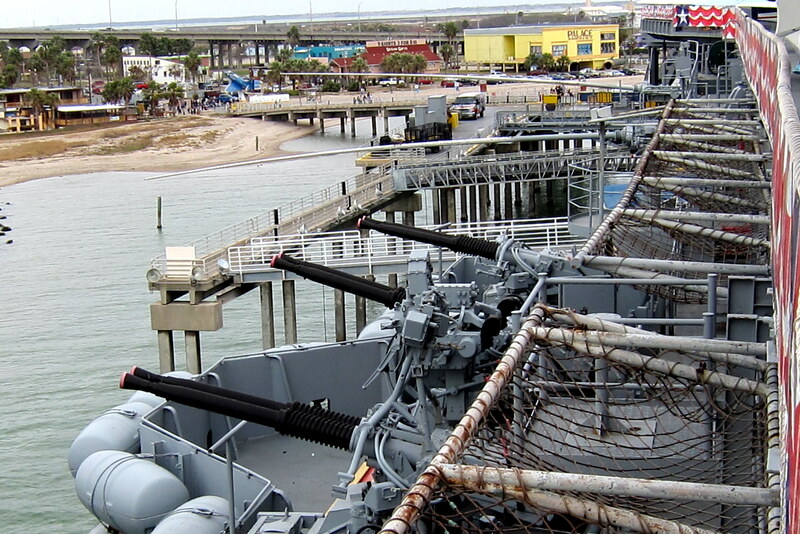 The gun mount shown in the picture above is a 5inch-38 caliber. I served on a destroyer that featured these type mounts and was assigned as part of the gun crew. While on the gun line north of the DMZ in Vietnam waters we fired so many rounds through those mounts that the paint literally burned off all the barrels. One would think that with an arsenal this formidable that this grand old lady could be repurposed into a Homeland Security asset. After all she sits close to Mexico where drug thugs are terrorizing the border towns of Texas. But…..what do I know? 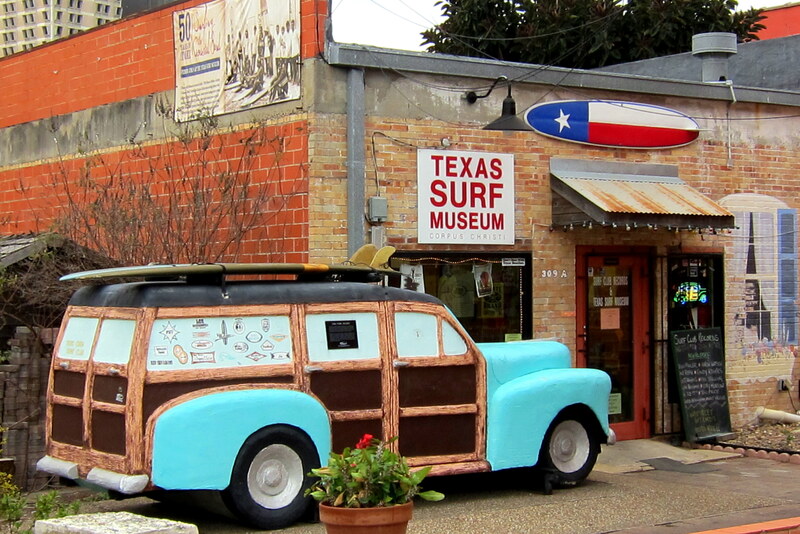 After touring the Lexington, I rejoined Kit and we headed downtown to seek out the Texas Surf Museum…..yep, they actually have one. Kit and I, having grown up in San Diego, were fully imersed in the California surf culture. Of course we knew there was very good surfing in Hawaii and had heard of pockets of good surf along the east coast but we had no idea that the sport was flourishing here as well. This museum was incredible. It featured a number of vintage and modern boards representing the evolution of the sport from the 1950’s through modern times. As a woodworker I particularuly enjoyed seeing the vintage balsa and mahogany boards from the late 1950’s. They were truly functional works of art! There was also an interesting display on “Tanker Surfing” where surfers would paddle their boards out into the shipping channels of the Intercoastal waterway and actually catch the bow or stern waves of departing or returning freighters and tankers. These rides could last for miles. However there were two displays really interested me as they both represented milestones in my teenage years growing up in southern California. The first was a very large, and as I remember, a very heavy surfboard that was simular to a model that I actually learned to surf on. 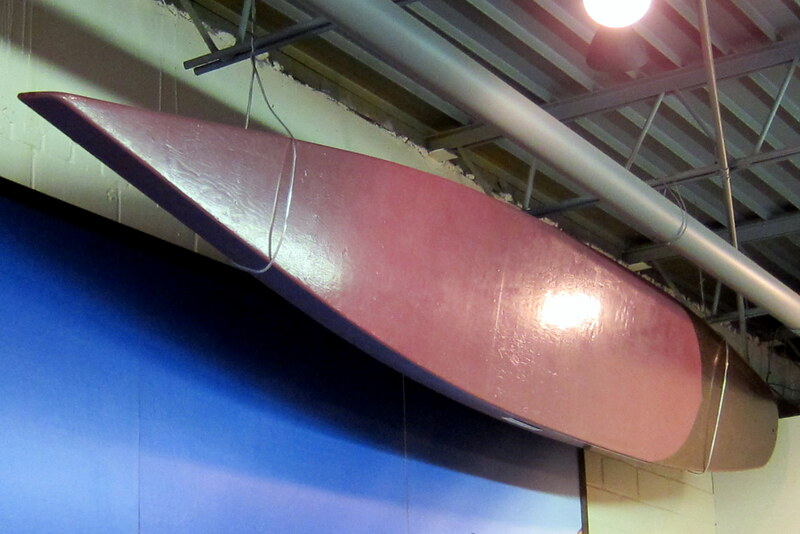 The hollow board was made of plywood and covered with fiberglass. The board was impossible to turn but very stable and afforded a nice ride on the smaller San Diego breaks. There was a brass plug in the nose that I had to use to drain water when the thing leaked, as it often did. 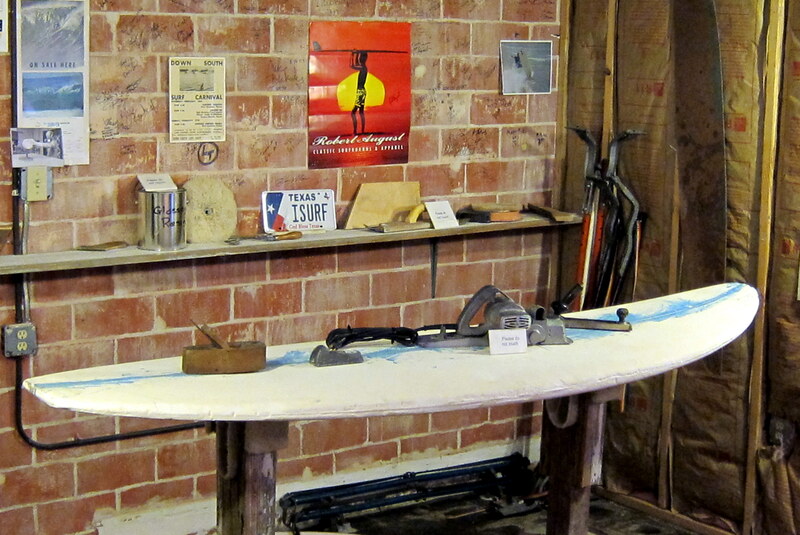 The board was actually a paddle board used by Abalone fisherman to harvest the shellfish in the1950’s. However it was all I could afford and served me for those first few years. The board on display was the same size and basic shape as the one I owned although mine was white. The next display that I could really relate to was a replica of a traditional neighborhood garage board shop. There were many of these around and they tended to be the hangout spots when the surf was down. After I got tired of trying to surf on that large, heavy, white tank I convinced my mom to purchase some reject Clark Foam blanks from the Gordon & Smith shop in town. 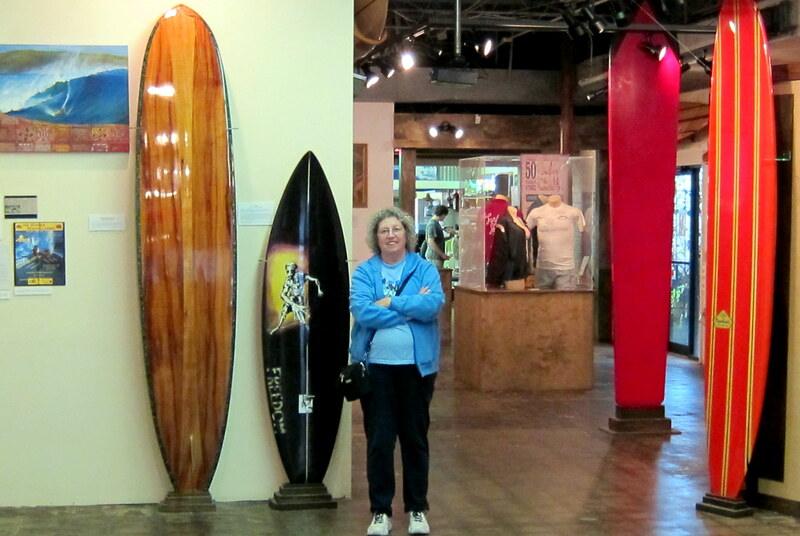 She then provided the resources for the fiberglass materials and I set up a stand very similar to the one above and hand shaped my very first real surfboard using many of the same hand tools shown in the display. 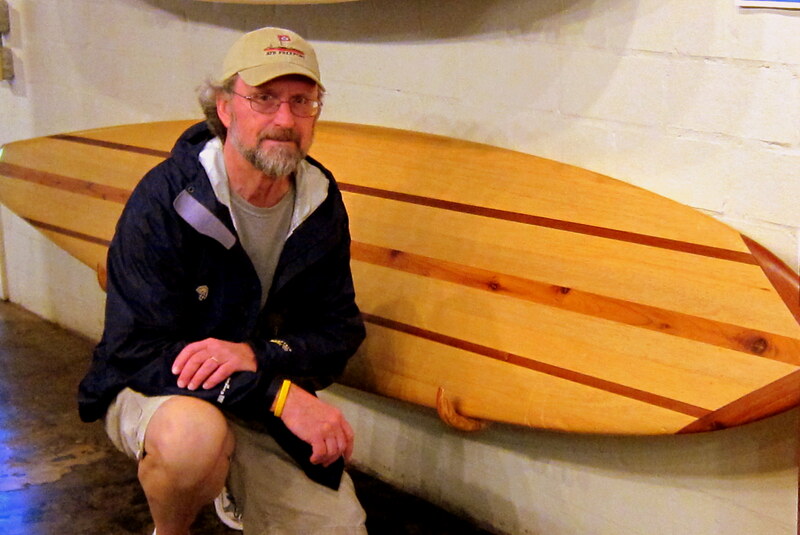 I later went on to build two additional boards (one that I actually sold…..for very little profit) and a Knee-board. I stood and looked at that display a long time…..it sure brought back some fond memories. 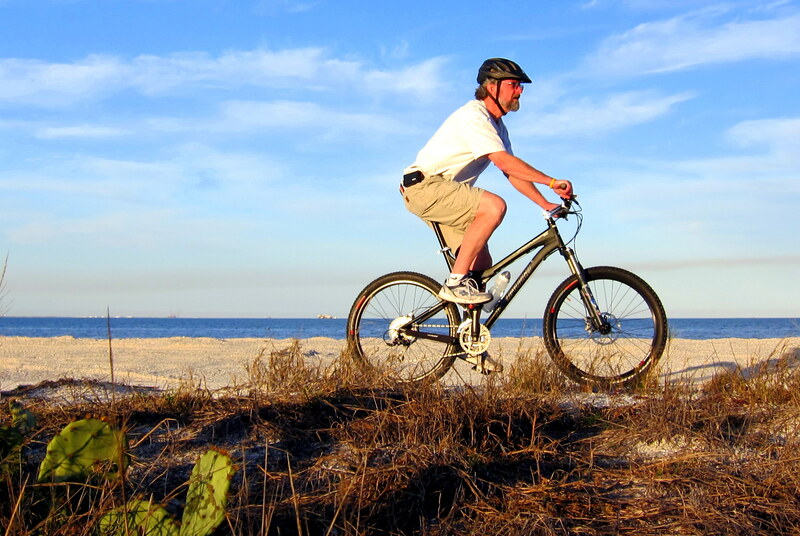 Stay tuned for the rest of our adventure in south Texas when we visit Port Aransas and Padre Island national Seashore. Kit’s Corner: According to some of the locals, it seems we hit upon the very best weather of the season in Corpus Christi! Everywhere we went, people were raving about how nice it was. Good for us, as we had not had any real warm temps up until then. We really loved the area and enjoyed our time at that particular campground. We both met some real nice people. As we were leaving, while on my morning walk, I noticed a car with Maine plates. The people were out so I stopped to chat with them. Turns out, they are from Lebanon, ME! They have just sold their home and are transitioning to full time camping. They still plan to spend a few months in Maine each summer with their family who they then invite to join them for the holidays in a warmer climate. Glad you finally got to some warmer weather especially since you are dry camping. Enjoy the warmer weather. We may have a house by the time you arrive here! We put an offer in on one yesterday! So maybe you can yard surf! Congratulations…..hope all goes well. Looking forward to seeing you folks in a few weeks. Sounds like you are finally getting warm; wish we were. I was at the Commissioning of the USS Gonzalas (?) several years ago in Corpus Christi. Also ate some great Mexican food there. Missed you at breakfast yesterday morning. 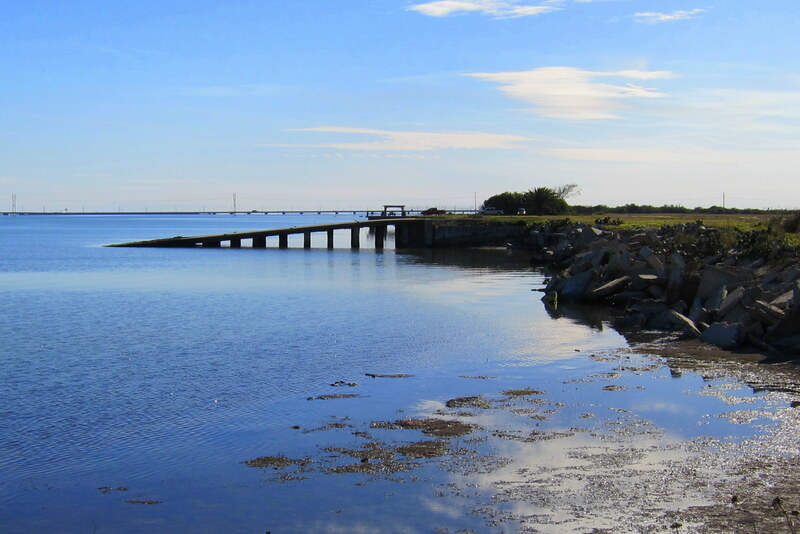 We really liked the Texas Gulf Coast and you’re right, the food was great! Save my spot in the OGBC; I’ll be back when the snow melts……I’m thinking August??? Great pictures, as usual!! Nice to see blue sky..oh wait! I think I see some out the window! Too bad it is 30 degrees! Yes, we enjoyed the “smell of money”…someone elses….as we drove through Texas oil fields in Dec. And that yellow bi-plane looks like one that was giving rides at an air show here a couple of weeks ago…a friend took a ride on it. One of the most interesting segments you guys have written. Really very interesting—will you soon become legendary Travel Authors –maybe there’s a future at the Travel Channel. Great stuff! Thanks for the kind comments. We are just poking along, writing about and photographing what we see. Kathy deserves a lot of credit for her proof reading skills and patience. Seeing some of the sights in this great country can cause me to be like a kid at Christmas. She is good at keeping me focused and calmed down. See you guys this summer! Warmer climate….that sounds real good to us. Enjoy reading the journals…..great pictures also!! Keep them coming.